From sales to installations, servicing and repairs, look no further than Superior Door Services. As an overhead door specialist for more than 30 years, we’re available to clients in the Fraser Valley from Surrey to Hope. Whether you need assistance for a residential or commercial property, our technicians have been trained and certified by the Canadian Door Institute, ensuring that you’re getting the most professional service possible. Superior Door Services isn’t just a business name, it’s a statement. As such, you can rest assured knowing that we only carry products that use the most durable and dependable materials. We’re a proud distributor of Steel-Craft, Northwest Door® and Clopay® products, all of which are well-known for consistently delivering innovative, highly-engineered and quality products. 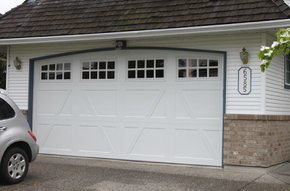 As convenient as automatic garage doors are, a malfunctioning door can put your home or business in a very vulnerable predicament. Whether you need to protect your belongings or bring your business back up to speed, give us a call for fast and efficient service! From broken garage door springs to alignment issues, our well-trained and experienced staff are available for garage door servicing and repairs.